I liked it, I really did. The end might have been a bit extreme, but it all makes sense if you have watched it all. Definitely not your average or stereotypical horror, though that is naturally your first impression when you see the friends, the road trip, the cabin. I mean, let’s face it, how many movies have we seen go down that very path? This, however, was very refreshing. I have got to give Marty props for the coffee cup bong, apparently weed saves lives. But on a more serious note, it was nice, it had a better twist than I have seen in a while, and all these things deserve mention and merit. I was a bit surprised to see Chris Hemsworth in a role like this, but no worries, it was not too distracting to see him this far out of what he normally does. It was also damn funny at times, and though it was predictable at places (typical horror scenes, but the plot twist was not as foreseeable) the film was exactly what it needed to be: entertaining. The movie was only just over an hour and a half, but for some reason it felt longer to me, though not in the bad oh-my-soul-it-is-never-going-to-end kind of way. At first glance, the ending seems a bit disappointing, but in retrospect it was actually exactly how the film needed to end, wrapping everything up pretty neatly. 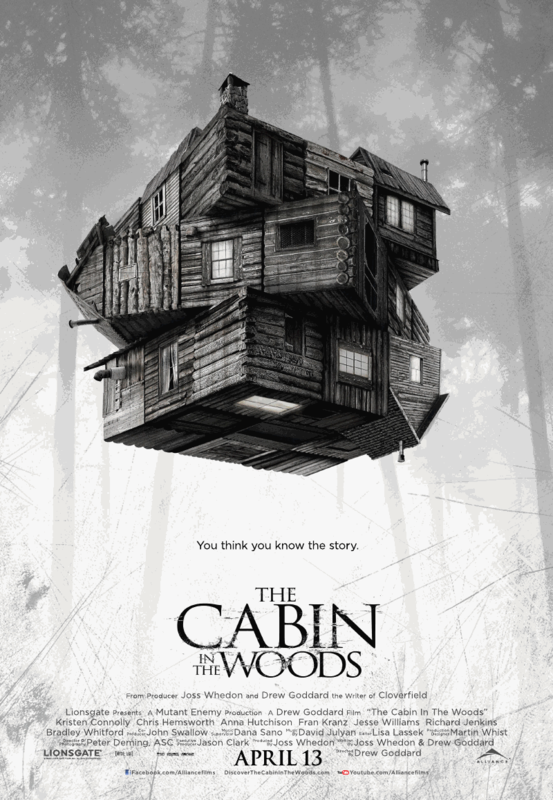 I would recommend watching The Cabin In The Woods, a nice twist and bags of fun. This entry was posted in Movies and tagged Anna Hutchison, Bradley Whitford, Cabin In The Woods, Chris Hemsworth, films, Fran Kranz, Jesse Williams, Kristen Connolly, movie reviews, movies, Richard Jenkins. Bookmark the permalink. This is really a wild movie isn’t it? It embraces every horror movie cliché and then blows it all out of the water. I really like that part of it. I think our views of it were very similar. I must say, when it started, I was just like meh, morning movie filler. Next thing I knew, as you say, they just blew every concept I thought I had pegged clean out the water! Fun, fun! Good review Zoe. It wasn’t as great as everybody felt like it was, but it sure was inventive and original. Don’t know why it took so long to actually come out, but I’m surely glad it did. Very true. Some people raved and gave the film far too much credence, but I felt it was entertaining and fresh, but not the best thing ever! A breath of fresh air at precisely the correct time! Zoe, I think I like this film even more after watching that Evil Dead remake. 🙂 I would love to see the new one so that I can see where you are coming from! I loved this film. Cool review! Lots of fun! Nice one Zoe. Pingback: Cabin in the Woods Review | Current events at 16. I liked this one a bit more, probably because horror is my favorite genre and this is the first enjoyable and original horror movie I’ve seen in years. I LOVED Marty, such a fun character. It really was the most original horror that I had seen in years, and I thoroughly enjoyed it!